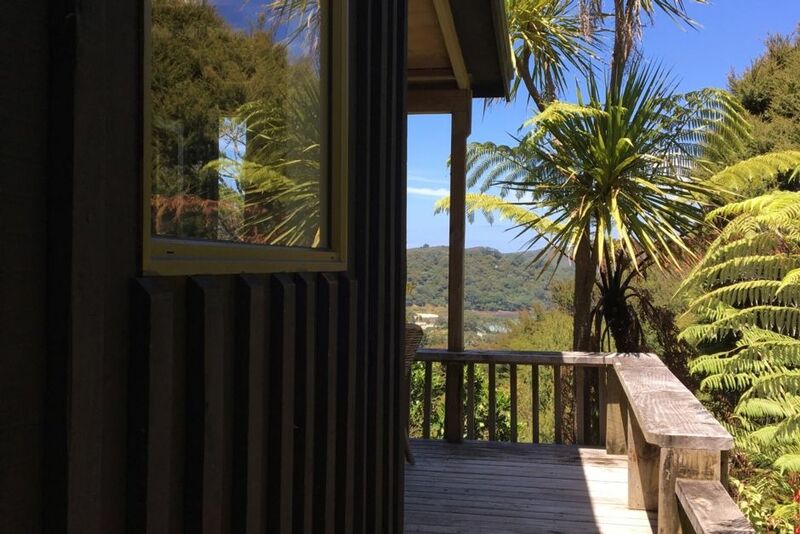 Kaka Cottage at Nikau Heights, is nestled in the bush with amazing sea views and a 5-10 minute walk to Tryphena's great amenities of the beautiful Pah Beach , Wild Rose Cafe, the Currach Irish Pub and a great general store. Kaka Cottage is well supplied for self-catering and has 12 volt solar power for lighting and refridgeration and gas for cooking and water heating. Kaka Cottage is named after the native parrot (the Kaka) a regular visitor to the area. Janet was a wonderful host, very easy to contact and replied immediately when we required assistance. Urla, the Irish cleaner, was an absolute dream and we are so glad to have seen her when we arrived. She offered some wonderful suggestions and obviously we had to try the Irish pub at her suggestion (great food and friendly staff!). Kaka cottage offered us the perfect retreat for two, nestled in the bushes surrounded by wildlife and seaviews. The cottage had everything we required including a small fridge, BBQ and all the kitchen items you'd need. The house was very clean and tidy and the bed is very comfortable. The location of the cottage was perfect for us; it is close to the general store, pub and cafe. We had the luxury of a car but it is close enough to walk (if you don't mind a few hills). I honestly cannot recommend Kaka cottage more. It is the best of the best on Great Barrier Island! Thank you for the memories and the wonderful stay. All good, everything we needed. My wife and I found the cottage to be exactly what we required for a short stay on the island. Very well equipped and maintained, we really enjoyed the peacefulness and privacy of the location and yet only a short walking distance in to Tryphena. There are great views down to the beach from both the interior and exterior seating areas which are well positioned to give all day sunshine. We would definitely recommend the cottage to our friends and family. Delightful secluded cottage in the bush and amongst the birds. Delightful secluded cottage in the bush and amongst the birds. Quite novel to exist on 12v electrics but all part of the charm. One felt close to nature, an ideal relaxing hideaway.